Join the PASTA (Parent Administrator Student Teacher Association) Fundraising Committee! Lend your time and talents to help make these and other fundraising projects happen. Monthly meetings are announced in the PASTA newsletter and are open to all interested Hawbridge parents. 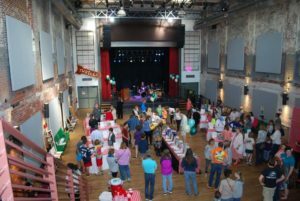 Learn more about the yearly Silent Auction! AmazonSmile: Hawbridge earns 0.5% of the price of your eligible Amazon purchases when you order from Amazon.com using our fundraising link. Harris Teeter Together in Education Program: Link your VIC card to #3951, and Hawbridge will receive a percentage of all qualifying items purchased when you use your VIC card at the beginning of each transaction. You must re-link your card every August. The following brands qualify: Harris Teeter Brand, H.T. Traders, Harris Teeter Farmers Market, Harris Teeter Naturals, youpet, yourbaby, yourhome, Hunter Farms, Top Care, More Value, and all prescriptions filled at the Harris Teeter in-store pharmacy. Kroger Community Rewards: Link your Plus Card to #91659. Lowes Foods: Go to “Cart to Class” link and search for The Hawbridge School. Office Depot : Order online using the code 70060551 and The Hawbridge School gets 5%. Weaver Street Market School Scrip Program: Purchase a pre-paid school scrip card (basically a gift card for yourself or even someone else) and link it to #246. You must give the cashier the number before he/she authorizes the card. Any amount can be put on the card and money can be added to it whenever you run out. Hawbridge will earn 5% of your purchases. Hawbridge Supply Closet: This PASTA program helps assure that our teachers have the supplies they need. Requested items are listed in the monthly PASTA newsletter. If you are able to donate items please send it with your student to be dropped off in the specially labeled box in the main office. Thanks for your donations!